A solid brass chrome plated body with a shackle made from hardened alloy steel. 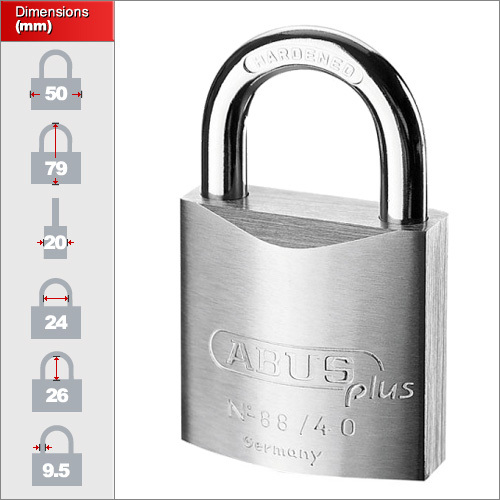 It is fitted with an ABUS-Plus disk cylinder offering the highest protection against manipulation with over 250,000 key variations. The padlock also benefits from a removable cylinder which makes it ideal for matching to additional padlocks or doors using your code card. 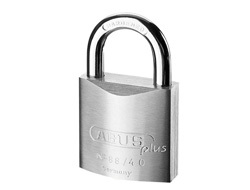 On our website we have one size of popular chrome plated brass padlock but we hold numerous different sizes and codes. Please contact us for specific models or sizes. Your padlock will come along with code-card which will identify it amongst 250,000 variations. If you require another padlock to match your code please contact us for more details.